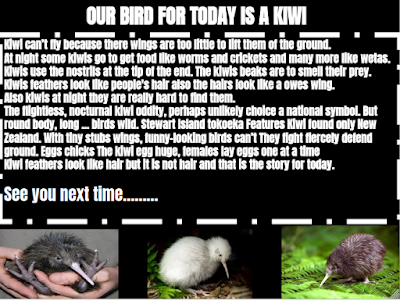 Today me and Sky had did some writing about NZ native birds. Kia ora Skye I'm Aryan from Gilberthorpe School just checking out your blog! Good job on getting all of these interesting facts. I never knew that kiwis ha feathers and not har. Where did you get these cool facts from?